Passover is the Jewish holiday that celebrates our freedom. Along with a ritual meal, we tell each other the dramatic story of our slavery in Egypt and our escape to become the Jewish people. Did you know that the descendents of Abraham, Isaac and Jacob weren’t the only people to leave Egypt with Moses? Yes, even in ancient times there were others who chose to throw in their lot with the Israelites. Together they witnessed the splitting of the sea and together they walked safely across on dry ground. Today’s interfaith families reenact that ancient joining together on Passover when they retell those events. Retelling the story of our slavery is the core of the Passover celebration. Every generation before us has expanded the story with references to other times of slavery, added new customs and traditions. No need to be a slave to the past! Learn the basics and customize your seder! Perhaps you didn’t grow up celebrating Passover and are feeling overwhelmed by all the details of hosting a seder. Let InterfaithFamily.com make it easier for you with this booklet. This colorful booklet lists all the ritual items needed for the Passover table. The history and significance of each item on the seder plate is explained, as are the customs that have been handed down through the generations in different centers of Jewish life. Understanding the symbolism not only enriches the seder experience but can also lead you and your guests to creative new interpretations. 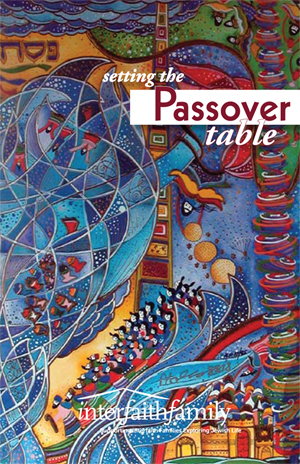 Let this booklet be a resource to you and those of your guests who are new to Passover.